I absolutely love the Met Live in HD series. This is all the wonderfulness of full-scale opera, but it's close to home and you get to eat Twizzlers and put your sneakers up on the movie theater seat in front of you because there are only five other people in the audience. And you get all the close-ups, and the fact that everybody singing is over 20 feet tall, which seems appropriate to the scale of the music. I find local screen-times at www.fathomevents.com. mention bringing out Buddhist elements in the text, but apart from a reference to Kundry having been reincarnated (so as to continually suffer for her blasphemy), I was knitting my eyebrows. Girard's production had a fabulous image of the knights (black pants, white shirts) sitting in a circle together and bending in and out, like a breathing lotus flower. They also included this intriguing group of motionless, veiled women, who stood in silent witness off to the side, until at the end, with the restoration of the grail, they were integrated again. These elements helped, but I think they were working against the opera to save it from itself, and the result is sort of a well-intentioned muddle (what was Act II about? what has Parsifal accomplished? ), which a more straight-forward "Chastity" storyline makes cleaner (allbeit less attractive). One of the best things about the production, I think, was the pacing, which might be called "ritualistic" (for example, the "breathing" in and out), that fits the pace of the music. 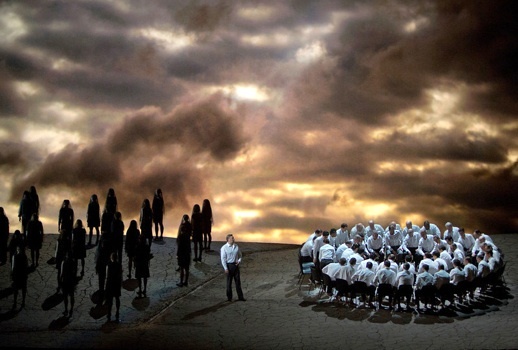 One of the problems, generally, in staging Wagner is that we are used to the actors/singers moving faster than his music allows the plot to progress, and sometimes people deal with this by bringing in extra chorus members to do extra things (Jonas Kaufmann's Munich "Lohengrin" production, for one). There were fabulous - baffling - projections of strange, alien moons, that were beautiful and added to the cosmic sense of the opera, far beyond the forests Wagner originally specified in his stage directions. And there was the unforgettable Act II in the pool of blood with Klingsor and the creepy "flower" maidens. In a opera so much about blood, this was just genius. "For these modern creatures wish rather to be hunted down, wounded, and torn to shreds, than to live alone with themselves in solitary calm. 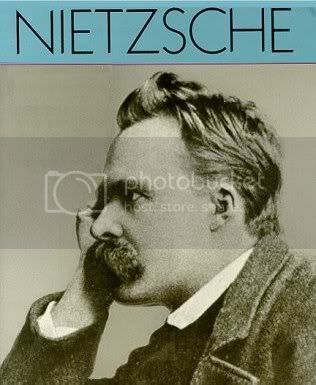 Alone with oneself!--this thought terrifies the modern soul; it is his one anxiety, his one ghastly fear." "Now there is but one kind of seriousness left int he modern mind, and it is limited to the news brought by the newspaper and the telegraph." "...it even seems as though the small amount of intellect which still remains active to-day, and is not used up by the great mechanism of gain and power, has as its sole task the defending--and excusing of the present. Against what accusers? one asks, surprised. Against its own bad conscience. And at this point we plainly discern the task assigned to modern art--that of stupefying or intoxicating, of lulling to sleep or bewildering... [t]o defend men against themselves, that their inmost heart may be silenced, that they may turn a deaf ear to its voice!" Substitute "entertainment" for art (let us be more charitable to modern art), and I think you have a pretty fair description of 21st century America's love affair with the iphone. Freudig, wie ein Held zum Siegen. Exulting as a knight in victory. Himmlische, dein Heiligtum! We approach thy shrine! Seid umschlungen, Millionen! Be embraced, Millions! Diesen Kuss der ganzen Welt! Take this kiss for all the world! Muss ein lieber Vater wohnen. Dwells above the canopy of stars. Ihr stürzt nieder, Millionen? Do you sink before Him, Millions? Ahnest du den Schöpfer, Welt? World, do you sense your Creator? Such'ihn über'm Sternenzelt! Seek Him then beyond the stars! Über Sternen muss er wohnen. He must dwell beyond the stars.